Plans to expand a key rail bottleneck will focus on building a new two-track bridge next to the 113-year-old Long Bridge and could also include an option for people to walk or bike across the Potomac. WASHINGTON — Plans to expand a key rail bottleneck for VRE, Amtrak and freight trains between Arlington and the District will focus on building a new two-track bridge next to the existing 113-year-old Long Bridge, and could include a new parallel connection allowing people to walk or bike across the Potomac River. 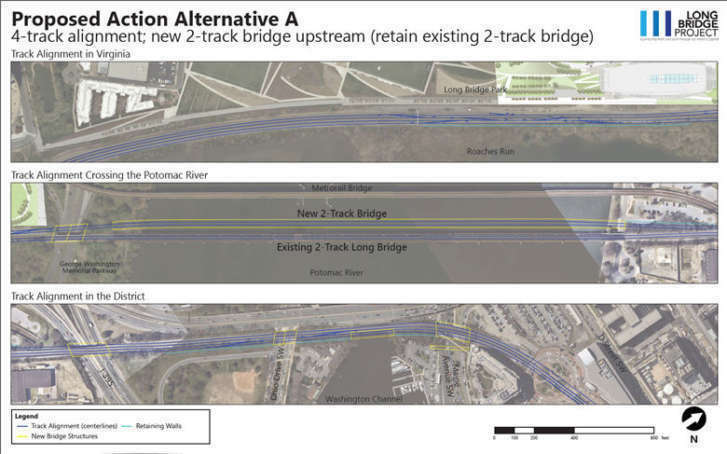 The District Department of Transportation, which is running the project study since D.C. controls the river, has narrowed down the alternatives for the rail expansion to either a new two-track bridge just upstream and keeping the existing Long Bridge or the same new two-track bridge and replacing the existing Long Bridge. In either scenario, new bridge structures would be needed over the George Washington Parkway in Virginia, and Interstate 395, Ohio Drive SW and Maine Avenue SW in the District, the new analysis presented last week said. The existing Long Bridge will also need repairs before any new bridge is completed. A bike and pedestrian path could either be built as a separate bridge next to those structures or as part of the new bridge. While that part of the crossing has not been completely reviewed yet, it is expected to get more attention in the engineering phases of the study. The initial suggestions show potential Virginia landings for the bike and pedestrian crossing stopping short of the George Washington Parkway to connect to the Mount Vernon Trail. While that would add a new option not present today, it would not provide the most direct connections to Pentagon City, Crystal City or the Pentagon that an extension across the parkway to an existing promenade at Arlington’s Long Bridge Park could provide. On the D.C. side, the initial ideas show a landing on Ohio Drive SW possibly between the East Potomac Park golf course and the Jefferson Memorial. Runners, walkers or people on bikes would then likely go past the Jefferson Memorial or tennis center to reach the Southwest Waterfront or 14th Street, or through West Potomac Park past the Lincoln Memorial or Kennedy Center to reach other parts of Northwest D.C. The bike or pedestrian crossings would end in an approximately 400 foot ramp with a slope of no more than 5 percent to comply with disability access standards and make the bridge more comfortable and accessible. After some additional analysis, the rail bridge alternatives will now move on to an engineering design phase. DDOT hopes to select its preferred alternative for the project this spring. After additional steps in the review, a draft environmental impact statement could be published in early 2019 to allow for required federal approvals by 2020 that would allow the project to be built. Today, there are 76 train trips over the bridge each weekday (34 VRE, 24 Amtrak and 18 CSX one-way trips). In 2040, planners hope to increase that to 192: 92 VRE trips, 8 MARC trips through to Alexandria, 44 Amtrak, 42 CSX and 6 Norfolk Southern one-way trips. CSX owns the tracks in the corridor, but regularly gets support for widening and other improvements from state rail agencies to increase freight and passenger rail capacity. DDOT is accepting public comments on this round of the review through Jan. 16 at info@longbridgeproject.com. The Long Bridge is the only rail bridge that connects Virginia to D.C. The second closest crossing is at Harpers Ferry. A second bridge structure would provide a backup in the event of maintenance or unanticipated problems. “Currently, there is insufficient capacity, resiliency, and redundancy to accommodate the projected demand in future railroad services. The Proposed Action is needed to address these issues and to ensure the Long Bridge corridor continues to serve as a critical link connecting the local, regional, and national transportation network,” planners wrote. One reason a five-track crossing was excluded in this round of reviews was the increased threat of derailment when trains change tracks. A five-track crossing would have required some of an interlocking to stretch over the river since current, separate plans call for four tracks on either side of the bridge in the foreseeable future. Among those separate plans, Virginia is adding a fourth track from near the Potomac River south through Alexandria including a planned rebuilding of the VRE Crystal City station which could include a new connection to Reagan National Airport.